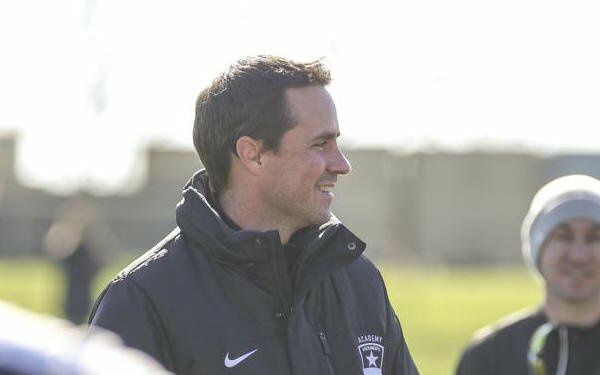 Since retiring after 13 MLS seasons in 2015, Todd Dunivant has worked as an executive for the defunct NASL champion San Francisco Deltas and is currently general manager of the USL Sacramento Republic, which is one of three cities in the running to be added as the next MLS expansion team. The Deltas’ victory in the NASL final last November marked the seventh time a pro team employing Dunivant, 38, had reached the championship game. He played for the 2003 MLS Cup champion San Jose Earthquakes and the Galaxy title teams in 2005, 2011, 2012, and 2014. He was also a member of the 2009 Galaxy team that lost the MLS Cup final to Real Salt Lake on penalty kicks. SOCCER AMERICA: It didn’t take you very long to find a place in the soccer business world. How did the opportunity with the Deltas come about? TODD DUNIVANT: I retired at the end of 2015 and I got a message from an old college buddy and he told me was a part-investor in a new soccer team in San Francisco and he asked if I wanted to meet the CEO. It started as simple as that. I graduated with a degree in economics [from Stanford] and was part of the collective bargaining agreements with MLS. That was a great way to get a feel for the business side. I had done some real estate on the side as well. I felt comfortable doing something off the field. I think that was really important as a player, to get some knowledge out of your comfort zone. It doesn’t really matter what it is as long as it makes you better and expands your horizons. Bobby Jaros was a hockey player himself, but he loved soccer and always followed it and followed my career, just a really good guy. It turns out he was kind of best friends with Brian [Helmick] and that was the connection. It was very intriguing talking to Brian. SA: A lot of pro soccer teams in San Francisco have failed and the NASL has been struggling since its formation. What persuaded you to give this project a shot? TODD DUNIVANT: I liked the vision of the club and the idea of starting something from scratch, of coming in at a high level and being able to do a lot of different things. As it kind of crystallized, there were a couple of things that were really interesting to me. Obviously, my bread and butter is on the soccer side and my title ended up being director of soccer operations and director of business development. So I had dual responsibilities there. But on the soccer side, I was tasked with overseeing and putting together our entire soccer operation, from our coaching staff to our players to our backroom staff. SA: The team couldn’t have turned out much better, with Marc dos Santos as head coach leading it to a championship. TODD DUNIVANT: Putting that together was incredible. I absolutely loved doing it. You have a broad canvas and you can shape it however you want. That was really fun for me, not just on the players’ side working closely with Marc, but the staff side as well. People who are like-minded but challenge each other and kind of set the tone you want day-in and day-out at the club. On that side, we really did well. Working with Marc day-in and day-out was a pleasure for me. I have a tremendous amount of respect for him and see big things in his future. SA: He finally has an MLS job, as assistant coach with Los Angeles FC, after being mentioned many times as a prime candidate. TODD DUNIVANT: I honestly couldn’t believe what was in front of us. I just thought, ‘Wow. This guy checks every box.’ He’s got a great record, he knows the game, but he’s also a great man-manager. The more you talk to people who’ve been around him – former players, staff members, those sort of people – the more you hear that is universally positive. That’s hard to find. We couldn’t find a weakness. The more you learned we kept waiting for the shoe to drop and it never did. It only got better. He’s enjoyed a lot of success. He took Ottawa to the [NASL] final in 2015. We started to get interested in him in 2016 and after Swope Park Rangers knew he was leaving, he took them to the [USL] final. Then he joined us and you know the story there. For me that was the important hire. He sets the tone and setting the day-in and day-out with the players on the field. He also had the intimate knowledge of NASL that I did not have. He’d been in the league for a long time. I knew a lot about MLS but didn’t know a lot about NASL. It was incredibly helpful to have his expert knowledge. SA: Word that the team was in serious financial trouble surfaced halfway through the season yet he and the players kept their focus. TODD DUNIVANT: Yes, exactly and that’s a very hard thing to do. I had to tell the players at the midpoint of the season, between the spring and the fall seasons, that there’s a very good likelihood we’re not going to be coming back. That’s a tough message for them to hear, but Marc and the players used it. We could feel sorry for ourselves and close up shop or we could stick it to them and win a bunch of games and do well for each other. That’s how we’re going to get jobs next year. And that’s exactly what happened. Using a negative situation to our advantage was huge and the team ended up bonding around it. It made the group stronger and closer. As an expansion team finishing second in the spring and second in the fall to a very good Miami team both times and then we ended up hosting two playoff games, and beating the Cosmos -- the most storied name in the sport’s history in this country -- in the final. It could not have ended any better. SA: Can you describe your emotions watching the fans storm the field at Kezar, chanting “One more year!”, knowing that the celebration was also the end? TODD DUNIVANT: It was bittersweet. The players were saying, ‘Can you believe what just happened?’ Knowing the fate of the club for months and months but still the team performing as it did. For now the final touch, the final play in league history, is a goal by Devon Sandoval to finish it. We had a good crowd for the playoff game, but it wasn’t sold out like it was for the final. So on the final day we got what ownership had envisioned for the club. Maybe it was too late on the business side, but from an emotional standpoint and satisfaction standpoint there was no better ending that having everybody storm the field. The guys got a just reward for a tumultuous season. SA: So what went wrong on the business side? Kezar is not an easy place to get to and there’s no parking plus cold weather at night even in the summer. Why couldn’t a very good team make it work economically? TODD DUNIVANT: It’s a great market, San Francisco, and the ambitions were very high. It was something I think everyone would want to be a part of. I don’t regret a minute of it. The off-the-field stuff was frustrating on a lot of fronts. There isn’t a lot I can get into or delve into publicly. I’d rather focus on what we did with the team on the field. SA: In the interest of full disclosure I must reveal I attended the victory party and it was epic. The staff and the players had obviously grown very fond of each other. TODD DUNIVANT: For me, I love being a part of teams and groups. What we did is something I’m very proud of because it’s so hard to build something from nothing and to have it end like that. It’s hard to put into words how gratifying that is and how hard it is to do. It’s a credit to our club, our staff, and our players. It was a pretty cool ending. SA: The situation and the challenge in Sacramento are much different. What other options did you have? TODD DUNIVANT: Honestly, I wanted to re-engage with everybody in the league. I know the league very well, it’s where I spent my whole career. So I reached out and kind of saw what was out there. In the end, I spoke with a lot of clubs and had a lot of good conversations and there were a few good opportunities but in the end Sacramento was sort of an easy choice. TODD DUNIVANT: I like the ownership group, I like the direction of the club, and I like the fact it’s kind of on the precipice. It’s a big deal here. The players feel it. There’s a lot of support, there’s a lot of pride. You don’t get that in most cities. That’s a good starting point. You put on top of that a good ownership group, a hungry ownership group that wants more and is knocking on the door of MLS, and a lot of good people who work for the club. It’s a pretty attractive situation. It sounds simple but I like to surround myself with good people and when you see an organization like Sacramento Republic that has such a great foundation, it was something I wanted to be a part of. I want to add my bits and pieces and try to make it even better. SA: You've been involved with many successful organizations. What do they have in common? TODD DUNIVANT: It’s how you treat people, first and foremost. At the end of the day, organizations are about people and if you can prioritize not just the star player but every player and the equipment manager and the guy who cuts the lawn, you need them all because it takes an army. The successful clubs I’ve been a part of do that well. They recognize that there are a lot of pieces that have to come together. There are a lot of moving parts. If you neglect a few areas, it shows up. It will show up in the stands and on the field. I’ve had 14 professional seasons, 13 as a player and one as an executive, and I’ve been fortunate enough to make the final in seven of those seasons. So one-half of my professional seasons I’ve been able to reach the final and I’ve won six of those. Like you said, you get a sense for what works and what doesn’t. SA: Sacramento won the USL title as an expansion team in 2014 and regularly fills the stands at Papa Murphy’s Park. You’ve mentioned the MLS ambitions. What’s the plan for 2018? TODD DUNIVANT: A lot of people have been here since day one and really love the club and have sacrificed a lot for the club. That’s great. Those things are really important, to have that camaraderie for years. It’s been good to see the different system here from what we had at the Deltas. I think here we have about 10 people just to work on ticket sales. At the Deltas, we didn’t have that. SA: To say the least. TODD DUNIVANT: That was a big omission. SA: You mentioned how important is was to hire dos Santos. The Republic has promoted one of your former Galaxy teammates, Simon Elliott, to head coach of the first team. TODD DUNIVANT: Simon is a rock. He really is. He’s been successful everywhere he’s been and remember Sacramento won the USL title in its first season (2014) and won the conference title in 2016, so the bar has been set pretty high. The fans have seen that success and have supported the team and rewarded the team. That’s something that is expected here and I would want nothing less. You want those expectations and you want a team that matters in the community. The academy has been a very positive thing for Sacramento. There’s so much talent here and we’ve not only found playing talent we’ve found coaching talent. We’ve promoted our U-17 head coach Simon Elliott and our U-19 coach Ben Ziemer to the first team. We need to replace those guys but that’s all positive. That means the club is promoting from within and people are doing well. SA: Sacramento has already reached that point where it’s consistently in the playoffs with a shot at the championship, but doesn’t the prospect of MLS alter your view of roster-building and player development? TODD DUNIVANT: For me, too, you want to be competitive and be in the conversation, but we kind of have two goals. We have 10,000 fans that we need to be able to put a good product in front of but we also have an MLS team we want to build for. We don’t have an official word yet but we’re working towards it and we’re confident we’re going to get there. We want to build a roster now that has as many players as possible that can make that MLS team. I’m under no illusion and I don’t think anybody else is that we’re going to bring 20 players from a USL team into MLS, but you can bring culture and a strong foundation so you hit the ground running. It’s been a great recruiting tool as well because we want players who have that same ambition and the same motivation to do well and move up when the club does. You start to put together a roster of players who are like-minded and want to do something not just for themselves but something bigger for the club. Our roster trends younger than it has in Sacramento and I think that’s the right way to think about it in terms of building towards MLS but also for doing well now. You kind of have to do both. Hopefully, that leads to a strong locker room and I believe a strong locker room is a good place to start the season.